Have you ever been in a situation where you just can’t believe what’s happening? Well I have. For me, this happened the evening before Easter. 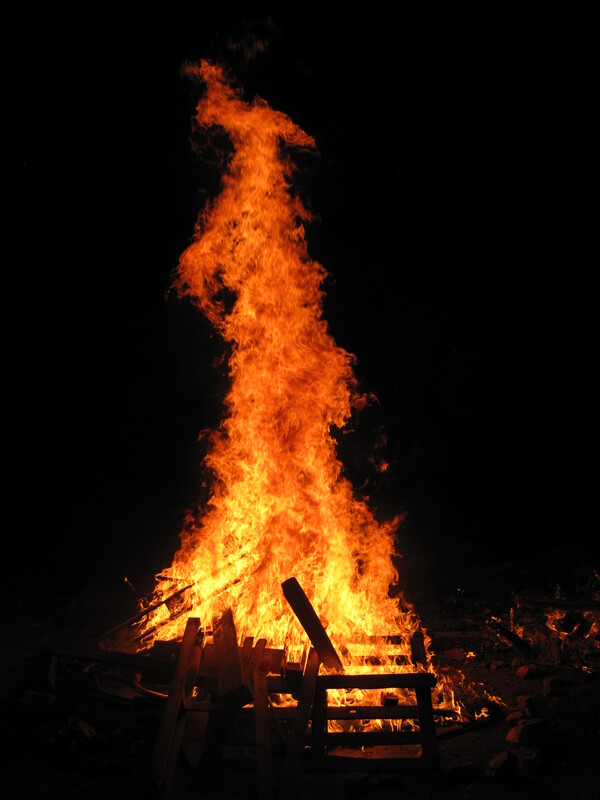 We decided to go to evening mass and then watch a bonfire, which is a German Easter tradition. I thought it would be a great experience for me. That evening, I wasn’t feeling well, but we went anyways. It was close to mass time when we arrived, so we were surprised to find the church dark. My husband guided me in, and as our eyes adjusted we noticed the filled pews. We looked at each other before making our way to the other side of the church, down the aisle without falling. With it being evening, all lights out, and the big heavy metal doors to the over one-hundred year old church closed, it made walking and finding a seat difficult without sitting on anyone. Once seated behind a huge cement pillar, we saw people with small candles in plastic holders. My husband went toward the back of the church, retrieved a couple, and returned. While we sat there, I whispered to him about how crazy it was to have people walking in a dark church. I said you’d never see that in the States. He asked why, so I told him because of the danger and the possible lawsuits from someone getting hurt. He explained that suing in Germany is different from in the States, because you can’t sue for such outrageous costs. Even so, I said, if an older person with poor eyesight were to fall, the church is liable for it. After about five minutes, the priests came down the main aisle and the altar boys and girls followed behind. The altar boys and girls stopped at each row, lit the first candle, and then that person turned to the person next to them, lit their candle and so on. My eyes widened from shock. What? We’re in a dark church, and everyone, including us has a lit candle balancing on the front ledge of the pews. The procession made its way to the altar, we all sat, but I kept turning around to make sure my coat and/or hair wasn’t about to become a pre-bonfire extravaganza. I nudged my husband, mouthing how crazy this was. Filled pews with young and old, coats and hair near flames, was inviting disaster. This wasn’t the plan I had in mind. I merely wanted to attend church, pray, and be thankful for all my blessings. Instead, I started to pray that I wouldn’t catch fire or that anyone would knock over a candle. Then I started to come up with emergency plans. If a fire started near the altar, I’d push my husband out of the pew and we’d run out of the church before anyone else noticed. Or if the fire started in the back, my husband and I would cover our heads with our coats, trample over anyone who got in our way, and run through the fire. After thinking about my emergency plans, I realized it wasn’t very Christian of me not to care for anyone else. To escape the flames, leaving our shoe prints on peoples backs, arms, and legs, made me worry about my soul. I’m going to burn in hell for these horrible thoughts. Who thinks about trampling over people in a church to save their own lives? I do, that’s who. My eyes began to scan those around me. I watched how they handled their candles, how nonchalant they were about the situation. I wanted to scream, “What’s wrong with you people?” Then I realized it wouldn’t make a difference. They’d just think I was mad. They wouldn’t understand me. But as mass continued, and I listened to the priest speak in a foreign language pretending to know what he was saying, I started to ease up and enjoy the candlelight ambiance. It began to feel peaceful, even though I was going to hell, so I might as well enjoy what little peace I could get. Halfway through church, the lights went on, and my body sagged a bit from relief. I still couldn’t help glance around at the people—the candles. Some of us blew out our candles when the lights came on, but more than I would have liked decided to keep theirs burning. Now came communion. My head started to spin from the incense and thoughts of the candles. People will be getting up, holding onto the pew ledge, LEAVING THEIR CANDLES UNATTENDED! Am I the only one who sees a problem here? Yes. Yes I am. Row by row got up for communion, their candlewicks flickering, as people passed by. Up to the altar I walked, thinking about my get away. Any minute someone could knock a candle over—a child kicking the pew, crying for sleep, except the church remained quiet, no accidents happened. And with all the horrors whizzing through my head, I was still able to find our pew. It wasn’t until the last song when everyone blew them out. Everyone filled the aisles, carrying melted candles, and headed over to the bonfire. Not us. I had had enough of fire. Tradition or not, I didn’t need to stand by a huge fire and think of more outrageous what ifs. I thanked God for us leaving church alive, went home, and hoped HE will forget about my emergency plans. Have you been in a situation you just couldn’t believe was happening? They way the candle flames preoccupied your thoughts is too funny, but completely understandable given the newness of the situation. Aside from recent events, I once had a parent burst into my classroom and yell at me about their child’s grades and how it was all my fault. She got in my face and it was pretty intimidating and surreal. Goes to show that there is a good reason why all visitors to a school should be required to check into the office. Whoah! That would be intimidating and scary. I agree that visitors should be required to check in at all businesses. Who knows what you’re about to encounter. When I worked at FINRA, all visitors were required to check in at the information desk before proceeding to the respective floors after 9/11. This was neurotically hilarious, and I hope you know I’m laughing WITH you, not AT you. I’d be just as paranoid… about dropping a candle, falling in the dark, having a pew light on fire, you name it. I bet looking back it was an incredible experience, though. One worth having. ABFTS, Good to know your laughter wasn’t directed at me. It was a great moment to witness. I just wish I hadn’t felt so awful so we could have attended the bonfire. Life is the ultimate experience. I think we all have issues, Jon. LOL!